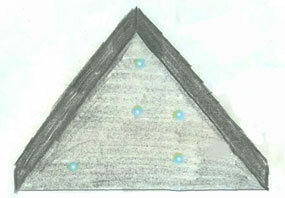 J. S. Jones sketched this triangle-shaped aerial craft as he first saw it from his second story Fort Knox Army barracks bedroom window in July 2003 after suddenly being awakened and abducted by grey humanoids. Now in 2018, telepathic communication continues in high strangeness. Illustration for Earthfiles © 2012 by J. S. Jones. Next PostNext What Is Happening In Utah?